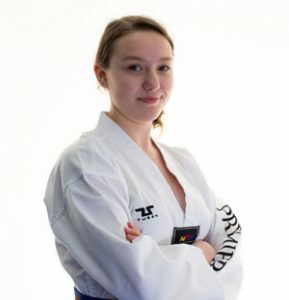 I started taekwondo when I was 14 and loved it straight away. I enjoy working at club in the Lil’ Dragon’s class. I like seeing them improve and grow in confidence as they carry on. I also enjoy learning new techniques and improving my fitness. I have successfully passed all of my gradings so far since joining Premier and I’m very grateful for being offered the chance to assist in the Lil’ Dragon’s sessions.